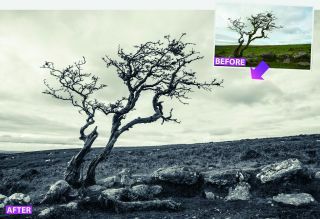 Landscape photographs shot on a dull day can lack impact due to drab colours, flat lighting and an absence of contrast. Interesting detail can be lost in the midtones. However, by using the Develop module in Lightroom you can tease out these details using the various sliders in the Basic panel. But you don’t need to stop there, as you can produce something much more striking – such as a dramatic high-contrast split-toned image. Photographs that have had a monochrome conversion can look very striking and dramatic in their own right, but by reintroducing a hint of colour into the scene you can evoke specific moods – such as melancholy blue or nostalgic sepia – and add more variety. This has been done since the earliest days of photography, though nowadays software has replaced the complex chemical toners used to achieve the colour effect, and you can be much more precise with the tones you choose. In this tutorial, we’ll show you how to use Lightroom’s Split Toning panel to independently tint a monochrome conversion’s shadows and the highlights with two distinct colours. Take toning_start.dng into the Develop module. Click the Black & White tab in the Basic panel to desaturate the photo. The histogram shows a lack of midtone detail. Drag Exposure to +0.30 to brighten things up. Raise Contrast to +29 and drop Highlights to -50. The tree stands out where it overlaps the sky, but the rest of the detail is lost in a mass of midtones. Drag Shadows to +27 to lighten the foreground and Clarity up to +80 to increase midtone contrast and reveal textures in the mossy rocks and blades of grass. To add washes of colour to shadows and highlights, toggle open the Split Toning tab. In the Highlights section, drag Saturation to 26. By default this adds a red tint. Click the Swatch icon to sample a new colour, or drag the Hue slider to 60 to add a wash of sepia. Set the Shadows Saturation slider to 14 to reveal a little colour in the darker areas. Drag Hue to 240 for a subtle wash of purple. We now have a warmer sky that contrasts with the colder colours in the foreground. Drag Balance left to -49 to make the purple dominant. We’ve kept the original split-toned colours, but we’ve boosted the Saturation of both colours to 60 and reduced the Balance slider to 0. The stronger colours emphasise the contrast between the sky and land. We used the colours from version one and the Saturation settings from version two, but pushed the Balance slider right to +46. This makes the highlight’s sepia more dominant, leaving a hint of purple in the shadows. We set the Highlights Hue to 21 and Saturation to 64. The green Shadows have a Hue of 137 and a Saturation of 50. The Balance of +35 stops the midtones in the clouds from being tinted green.